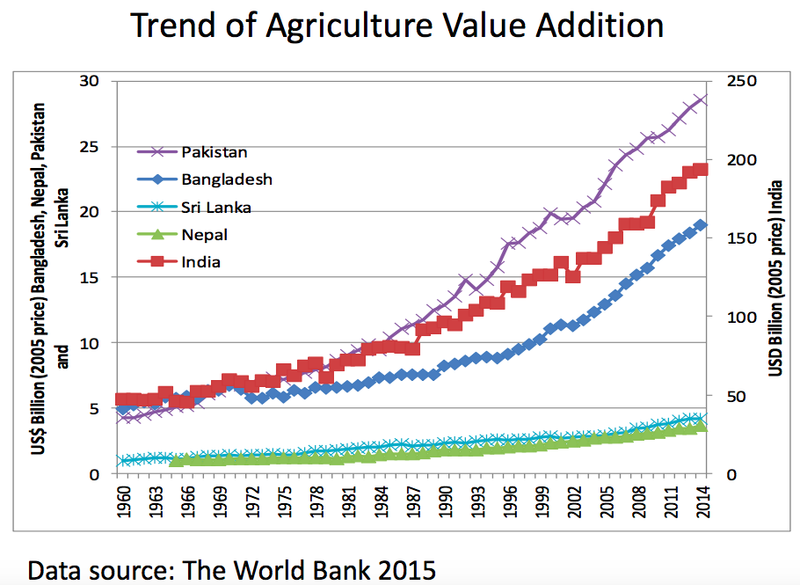 While Pakistan has lagged in South Asia region in manufacturing value addition, the country enjoys a significant lead in agriculture value addition over Bangladesh and India. Livestock revolution and increasing farm mechanization have enabled Pakistan to significantly raise agriculture productivity and rural incomes since 1980s. There is rising tractor ownership and growing economic activity in dairy, meat and poultry sectors now accounts for just over 50% of the nation's total agricultural output. The result is that per capita value added to agriculture in Pakistan is almost twice as much as that in Bangladesh and India. However, Pakistan still gets less crop per drop than India which means there is significant opportunity for water saving. As of 2014, the agriculture value addition in Pakistan is estimated at $1,050 per worker, significantly higher than $700 per worker in India and $600 per person in Bangladesh., according to the World Bank data as reported by Dr. Krishna Pradad Pant in Agriculture Investment in his paper titled "South Asia:trends, opportunities and challenges". Agriculture mechanization is measured in terms of tractor ownership in horsepower per hectare of cultivated land. It has grown in Pakistan from 1.02 hp per hectare in 1992 to 1.5 hp/ha in 2015, according to a paper titled "In Pakistan, Agriculture Mechanization Status" by Muhammad Aamir Iqbal. It is still significantly lower than India's 2.50, China's 3.88 and Japan's 7.0. Pakistan's tractor market is growing. In 2017, over 60,000 tractors were sold. Production capacity stands at 70,000 units per annum and models range from 55 to 85hp, according to a report in Pakistan's Dawn newspaper. Since the launch of the indigenization program initiated in the eighties by the Pakistan Tractor Corporation, the industry has achieved 95% localization in terms of production. Data on irrigation efficiency in Pakistan highlights significant opportunities for saving water. In an average rainfall year, the water productivity for wheat in Pakistan (0.76 kg/m3) is 24% less than the global average (~1.0 kg/m3), according to Water Watch . During the drought of 2001- 02, water productivities were at the same level as the global average. Hence, drought results in a more efficient utilization of water resources by wheat crops grown in the rabi (the dry winter season). Water Watch found that rice yield in Pakistani Punjab is on-average 24% higher than in Sindh. The water productivity of rice (0.45 kg/m3) is 55% below the average value for rice in Asia (~1.0 kg.m3). Contrary to wheat, the water productivity of rice decreased during the 2001 drought, because rice is sensitive to water stress and to salinity that is intensified through increased groundwater withdrawals. Pakistan lags India in water productivity. Crop yields show distinct North-South and East-West variations: wheat yields in the Indian Punjab average 29% higher than in the Pakistani Punjab to the west, and wheat yields in the Pakistani Punjab are 33% higher than in the Pakistani Sindh to the south. These spatial patterns of wheat yield are similar for 1984-85 and 2001- 02. Because crop evapotranspiration in the Pakistani Punjab and Indian Punjab are similar, the difference in crop yields between these two regions is also responsible for the difference in water productivity values. This important conclusion implies that increased water productivity can only be achieved by increased crop yields. Experiments of the Pakistan Agricultural Research Council across the country (n=41) have indicated that the overall yield of wheat can be increased by 54%, provided that inputs are optimal. Improved management of water quality (groundwater and canal water) and evacuation of drainage water are important components for improving agricultural production. Seed quality, fertilizers, and pesticide control should also be improved. 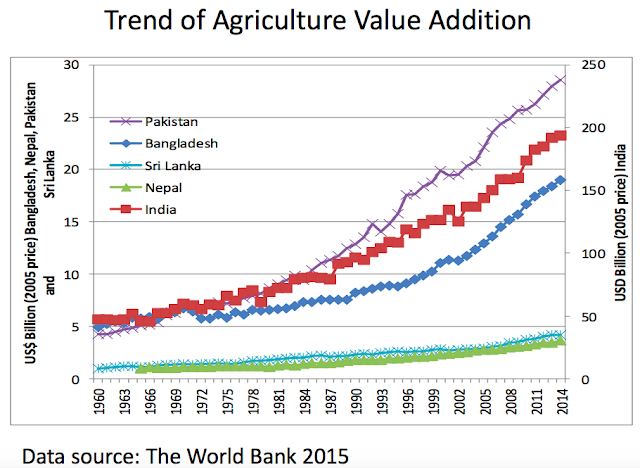 While Pakistan has lagged in South Asia region in manufacturing value addition, the country enjoys a significant lead in agriculture value addition over Bangladesh and India. Livestock revolution and increasing farm mechanization have enabled Pakistan to significantly raise agriculture productivity and rural incomes since 1980s. There is rising tractor ownership and growing economic activity in dairy, meat and poultry sectors now accounts for just over 50% of the nation's total agricultural output. 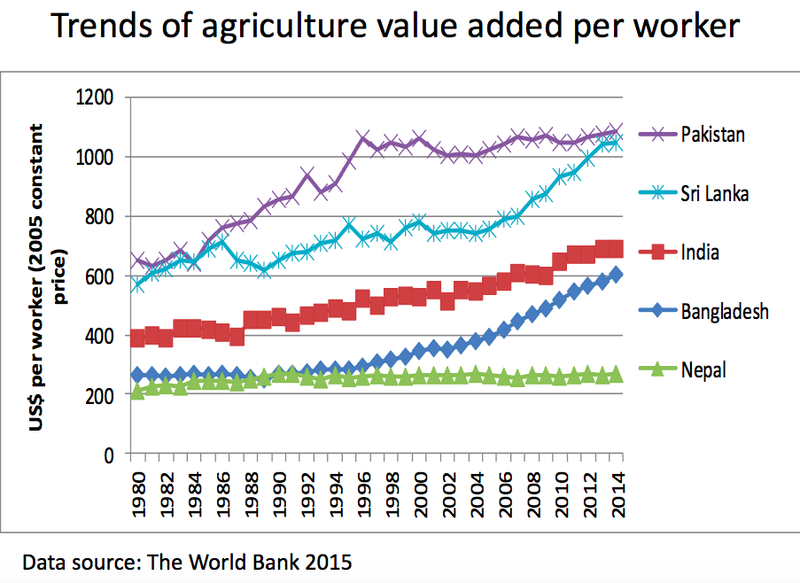 The result is that per capita value added to agriculture in Pakistan is almost twice as much as that in Bangladesh and India. 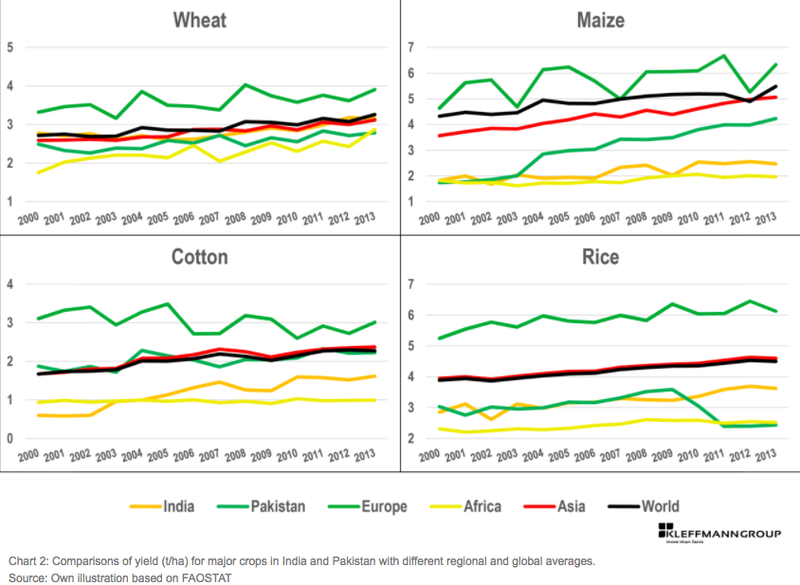 Pakistan still gets less crop per drop than India which means there is significant opportunity for water saving. Mr. Haq, this is encouraging news and with the construction of the new dam, I am sure productivity will increase. We have to do more and Inshallah we will. Thank you for providing the important links as well. Groundwater Aquifers vs Dams. Building large dams is only part of the solution to water stress in Pakistan. Even more important is building structures to trap rain water for recharging aquifers across. ISLAMABAD: The Food and Agriculture Organisation (FAO) of the United Nations says Pakistan is among the three countries in Asia and Pacific region which are the world’s top dairy producing countries. The total value of Asian dairy production exceeded $110 billion in 2013, and figured in the three top commodities in the region in terms of gross value of production. While the dairy production in Pakistan, India and China largely meet domestic consumption, Australia and New Zealand produce a surplus, FAO says on the occasion of World Milk Day being celebrated on June 1 (Thursday). According to latest figures published in Pakistan Economic Survey 2016-17, milk production in the country is on the increase and during the current fiscal year the gross production of milk was estimated to be 56,080,000 tonnes. FAO warned that while dairy has big potential, the sector needs to be more sustainable and competitive in Asia and Pacific region. This means helping smallholder farmers gain greater access to markets and services and develop successful dairy business models to increase domestic production. The aim is to create a sector, which is socially responsible and produces safe and healthy food making more efficient use of the natural resources and reduces the effects on the environment. Only by doing so, will the sector become more sustainable for the benefit of future generations. FAO remains committed to working with all stakeholders to achieve a dairy sector that contributes to health and prosperity of the world. An Asia Pacific Regional Audit done by the International Osteoporosis Foundation has concluded that the average dietary calcium intake in Asia is well below the FAO-WHO recommendation of 1,000 to 1,300 milligrams per day and most Asian countries have seen a two-to-three fold increase in the incidence of hip fractures during the past 30 years. In order to facilitate dairy farmers, duty free import of calf milk replacer and cattle feed premix was allowed. During the current fiscal year, 310.2 metric tonnes of calf milk replacer and 298.9 metric tons of cattle feed premix was imported. Last December, the Royal Friesland Company acquired 51 per cent of Engro Foods Pakistan, which was one of the largest private sector foreign direct investments in Pakistan’s dairy sector, amounting to $450 million. Under the new deal and 2020 strategy arrangements, Engro Foods will aim for higher milk quality, variety of milk packages and products and farmers’ capacity building leading to a reduction in poverty. In addition, regulatory duties to the tune of 25pc have been imposed on the import of skimmed milk powder and whey powder. This is to attract further investments in the dairy sector along with protecting small dairy farmers. The domestic production of tractors during fiscal year 2017-18 witnessed growth of 33.20 percent as compared the production of the corresponding period of last year. During the period from July-June, 2017-18 about 71,894 tractors were manufactured as compared to the 53,975 tractors of same period of last year. On month on month basis, the local production of tractors also grew by 15.21 percent as it was recorded at 3,926 units in June 2017 to 4,523 units in June 2018. according the Quantum Index Number of Large Scale Manufacturing. It may be recalled that the overall Large Scale Manufacturing Industries (LSMI) of the country witnessed growth of 5.38 percent during the year 2017-18 compared to last year.The LSMI Quantum Index Numbers (QIM) was recorded at 147.07 points during July-June (2017-18) against 139.55 points during July-June (2016-17), showing growth of over 5.38 percent. Meanwhile the production of trucks witnessed growth of 5.76 percent by going up from the output of 608 units in June 2017 to 643 units in June 2018. The production of trucks also increased from 7,712 units last year to 9,187 units, showing growth of 19.13 percent while the production of tractors increased by 33.20 percent, from 53,975units to 71,894 units. On year-on-year basis, the production of jeeps and cars increased by 40.90 percent during the month of June 2018 against the output of June 2017. During the period under review, Pakistan manufactured 16,234 jeeps and cars during June 2018 against the production of 11,522 units during June 2017. During last financial year, the production of light commercial vehicles (LCVs) witnessed an increase of 19.74 percent in production during the period under review by growing from 24,265 units last year to 29,055 LCVs during 2017-18. Dedicated to private sector agricultural technology innovation as a key to unlocking the full potential of Pakistan’s horticulture, dairy and livestock sectors, USAID Pakistan through the Pakistan Agricultural Technology Transfer Activity signed Memoranda of Understanding (MoUs) with 10 leading private sector agri-tech companies to help scale up investments in affordable new agricultural technologies. The project has signed MOUs with Ali Akbar Group Enterprises, CattleKit, Farm Dynamics, Haji Sons, Farm Solutions, Dairy Solutions, Solve Agri Pak, Matra Asia, Ravi Agriculture, and Noorani Industries. The PATTA project partnership seeks to enable agri-tech knowledge transfer and eliminate the barriers to technology adoption, increasing awareness and ultimately enhancing farmers’ production, and profits. The results will improve Pakistan’s overall agriculture-fuelled economic infrastructure and contribute to food security. This local partnership-driven technical assistance is spearheading private sector development in the agricultural technology sector. USAIDPATTA will support at least 30 private sector companies to become more competitive and profitable by upgrading equipment, commercialising and marketing500 technologies and modernizing management practices. Technology, innovation and agriculture can increase agrarian production, profitability and expand the work forceby 3400 jobs. Private sector investment is expected to increase by USD 4.8 million and sector sales by USD 17.68 million in 4 years through PATTA’s initiatives. In a recent MOU signing ceremony, CEO Farm Solutions Bilal Chaudhry stated that partnership with USAID will enable the private sector to accomplish gains that cannot be realized alone. PATTA’s 10 private sector partners are also striving to narrow the gap between men and women by providing opportunities to women farmers and entrepreneurs. One of these partners – Haji Sons – has ensured that their technology demonstrations also reach female farmers, enabling them to adopt leadership positions in agricultural technology. Pakistan and China have agreed to broaden agro-cooperation by adopting a comprehensive approach to fast-track communication and implementation to tap the immense potential of the most important sector, a statement said on Monday. “Agricultural cooperation will set new and important direction that should focus on areas as well as the level of cooperation and finalisation of specific plans,” MA Aiguo, Vice Minister for Agriculture and Rural Affairs, China, said in a meeting with Makhdum Khusro Bakhtyar, Minister for Planning, Development & Reform (PD&R). Aiguo said China was ready to share its expertise and successful agriculture models with Pakistan. Bakhtyar said Pakistan’s agriculture sector employed 45 percent of manpower and contributed about 24 percent in GDP. “It provides livelihood to 64 percent of the country’s rural population and shares 20 percent in total exports,” the minister added. The minister identified that Pak-China agricultural cooperation had to focus on the vertical increase in productivity of existing crops, transfer of knowledge and technologies, seed and plant protection as well disease control, value addition and marketing of agri products including dairy, livestock, and fisheries. “The mutual cooperation should cover the whole basket of agri-sectors,” he added. Bakhtyar stressed there was a massive potential of developing Pakistan’s agriculture sector and achieving a win-win situation. He pointed out that joint ventures, value-addition, cold chain management for fruits/vegetables, marketing, and branding would help Pakistan overcome the past weaknesses and increase its exports to China and other nations of the world.